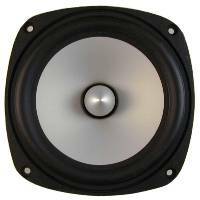 The ideal loudspeaker driver features a rigid diaphragm and no resonance. Alcone-Divers have an exceptionally rigid diaphragm made of aluminium compound; their high frequency resonance can easily be handled by the crossover. Alcon drivers have been reviewed by the magazine Klang+Ton and were attributed an excellent price-performance ratio. We were very excited when we first saw the waterfall spectrum of the AC 5.25HE. Some of our customers who appreciate the Seas Excel, deployed repeatedly Alcone drivers with their excellent price-performance ratio. The following kits feature an extravagant cabinet construction. To reduce the tendency of resonance by the wood, the cabinets are designed with internal, perforated braces.. The original RCM kits supplied by us consist of all drivers, crossover components (to be mounted on wooden parts of the cabinet), damping material, bass reflex tube, binding posts, interior cabling and wood screws. The kits do not (as usual) contain the wood for building the cabinet.